Thanksgiving dinner is a pause. I somehow put everything down for three days and focus on bringing one meal to the table. In a life filled with multi-tasking and the constant feeling that I lost a week somewhere in 2003 that I desperately need to get back, it’s a moment of peace. That peace begins with a deep breath and a pot of stock. Even before I’ve finished the menu, the house fills with the scent of roasting meat and rough-chopped aromatics. Stock is effortless and rote, a handful of ingredients with no complex techniques, simply roasting and simmering with a little deglazing in between. But, for its simplicity, stock adds great complexity and depth to the meal that lades the table Thanksgiving day. It brings satisfying richness. It elevates pan drippings into gravy, layers the simple sugars that glaze sweet potatoes and parsnips, transforms day-old bread into moist, herbed stuffing. Let’s hit the kitchen. *You’re looking for cheap meat, less than $3 a pound, with some bone in it. Have your butcher chop it down for you. Place turkey pieces in a single layer in a heavy bottomed roasting pan (you’re going to put the pan on the stovetop later). Do not crowd the turkey. Roast in two batches if needed. Roast the turkey until rich brown, about 1 hour. Remove turkey to a large stockpot. Add carrots and onion to the same roasting pan. Toss them in the rendered fat from the turkey and place in the oven. Reduce heat to 375. After 30 minutes, toss the roasting vegetables in the tomato paste and return to the oven. Turn the oven back to 400 and roast for 10-15 minutes until golden brown, watching carefully not to burn. Remove vegetables to stock pot with roast turkey. Place the roasting pan over two burners on medium high and add white wine. When wine comes to a simmer, scrape up all the brown goodness. When wine reduces to 1/4 cup, add additional water if needed to finish scraping the brown bits from the roasting pan. 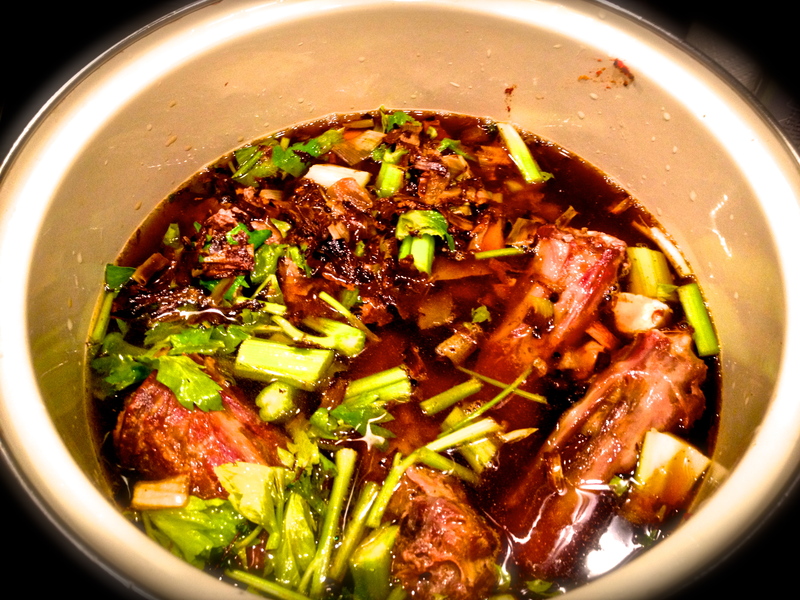 Pour deglazed pan juices into stock pot and add remaining ingredients. 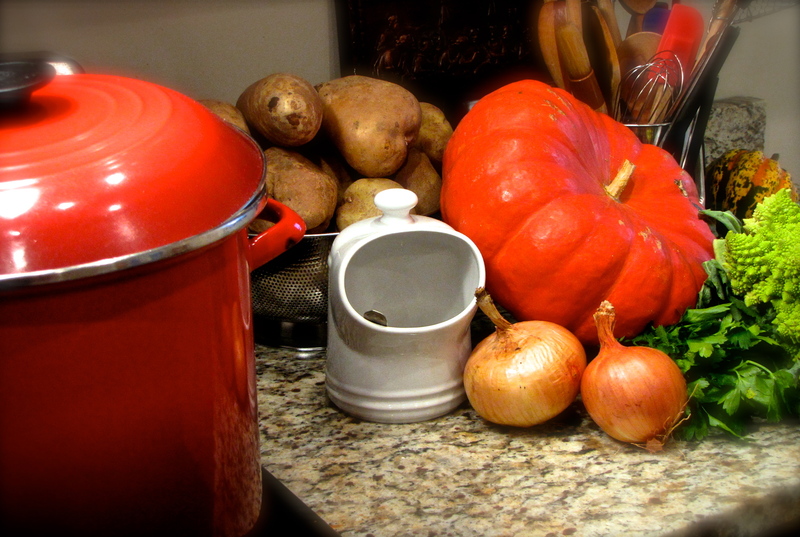 Fill pot with cold water to cover turkey and vegetables by 2 inches. Bring the pot to a simmer over medium low heat, partially covered. It will take about 45 minutes. Skim off any foam that collects on the surface. Continue to simmer stock, partially covered, just a bubble or two every few seconds, for three more hours. Be careful not to let it come to a boil. Add more cold water if needed to keep meat covered. Skim any additional foam that collects on the surface. After three hours, strain the stock and remove the solids, discarding them. Strain the stock through a fine sieve and then one more time through a sieve lined with a layer of paper towels or double layer of cheese cloth. You will have to change out the towels or cheese cloth several times, as they become clogged. Place strained stock in the fridge overnight. In the morning, skim the coagulated fat from the surface. Taste a little stock with a pinch of salt. If needed, reduce stock by up to 25% to concentrate flavor. It should make about 3-3.5 quarts. Refrigerate for three days, or freeze up to 6 months. The first time I made this dish I nearly killed my parents. 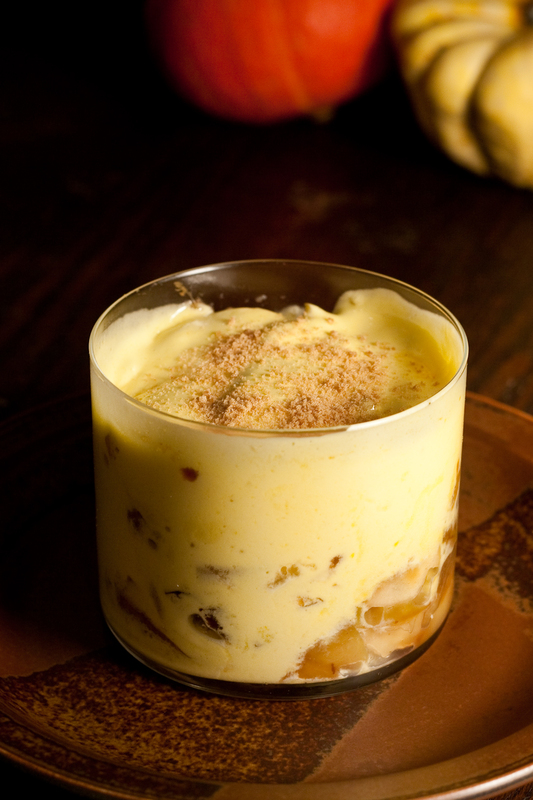 Zabaglione is simple, in concept. Whisk together 8 egg yolks, 1/3 cup of Marsala wine and 3/4 cups sugar. Place it in a metal bowl, over a pan of simmering water, and whisk until it increases to three times it’s volume and will hold a soft peak. Serve over fresh berries. There, wasn’t that easy? How can such a simple dish go wrong? Cook the custard over high heat and fail to whisk constantly, allowing the eggs to scramble before the proteins can uncoil and form air pockets. Then, you end up with about 1 cup of custard, barely a few tablespoons per person, of highly concentrated fat, sugar and alcohol. Which is exactly what I served my parents the first time I made it. Despite several near heart attacks that night, everyone remains healthy to this day and we continue to enjoy much lighter Zabaglione, like this autumnal version I’ll be serving up at Thanksgiving dinner. *Sapore’s new winter vinegar. 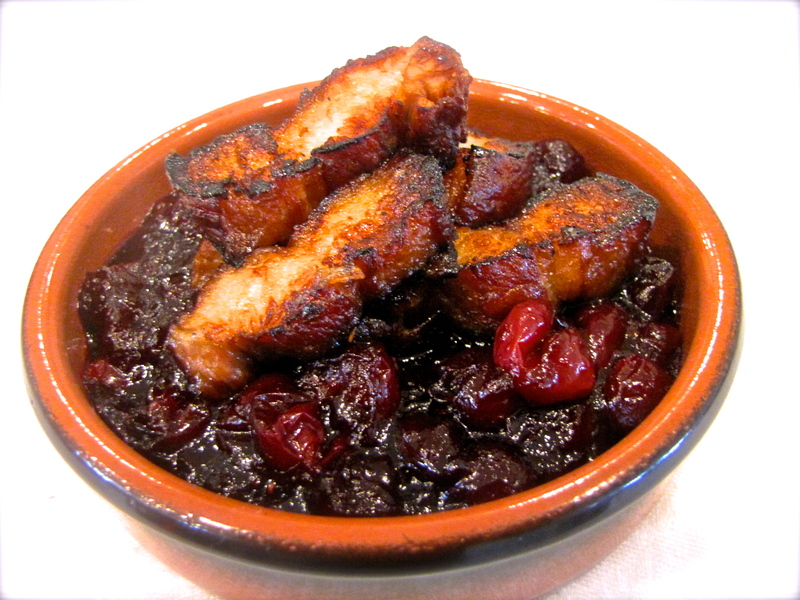 You can substitute a syrupy aged balsamic vinegar and a pinch of cinnamon. Whisk together egg yolks, sugar and wine in a metal bowl placed over a saucepan filled with simmering water. Whisk steadily, keeping water at a simmer, until cooked through, and volume triples. about 5-7 minutes. Melt 2 tbs butter in large sauté pan over medium heat. Sauté 1/2 apples for five minutes. Remove, add additional tbs butter and sauté remaining apples. Remove from pan. Add sugar, nutmeg, Calvados, vinegar and remaining butter. Simmer until thick. Add apples and toss to mix. Serve apples topped with custard. I recently asked the question, “should I use bacon fat?” It was largely rhetorical. My husband Jason, our friend Sam and I were in the test kitchen working on a recipe for a Brussels sprout slaw. Inspiration had come in the form of Sapore Oil and Vinegar‘s new Harvest Apple vinegar. Expecting apple pie in a bottle, my nose was greeted with something closer to Worcestershire sauce. Though not as savory, the vinegar sang a siren song of Brussels sprouts, sharp, grainy mustard and bacon. It was a song we had heard before. Around this time last year we answered a similar call. 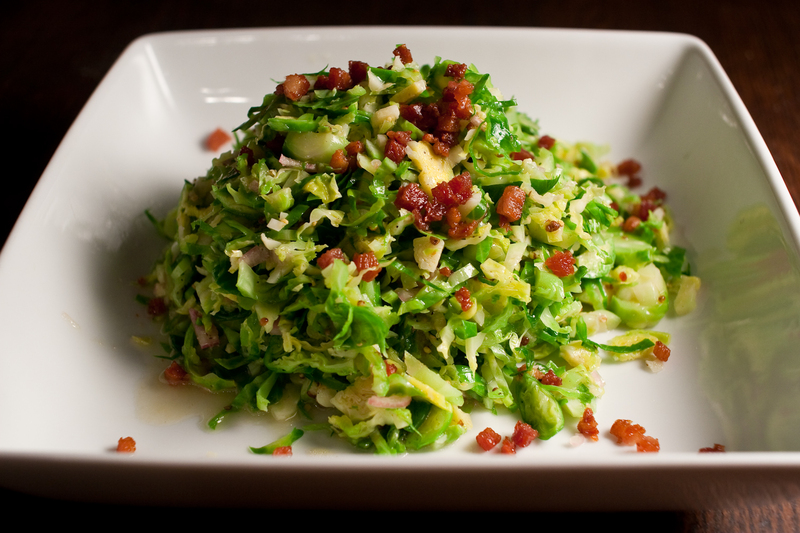 Blanched, shaved sprouts were dressed in a bacon fat, mustard, sherry vinaigrette. This time the results were different. Maybe it was the lower acidity of the Harvest Apple vinegar, or maybe it was the rich, sweet and sour sweet potatoes we had just eaten, but tasted side-by-side, we preferred a light, grassy olive oil over rich, salty bacon fat. Are we retiring last fall’s bacon fat version? No, with a crisp loaf of bread or a savory celery root soup, the bacon fat version is still our choice. However, sitting amidst a table loaded with stuffing, potatoes, turkey and gravy, the light, bright, more acidic version is a welcome island amidst the starch. *It’s the holidays – treat yourself, and order a couple bottles online at Sapore Oil and Vinegar. If you need a substitute for the Autumn Apple Vinegar, combine 4 tbs Sherry vinegar with 2 tbs cider or apple juice. Frantoio is a light, grassy olive oil. you can sub any good quality oil. Blanch Brussels sprouts in salted, boiling water for 1 minute. Remove to ice bath. When cool, drain and pat dry. Sauté pancetta in 1 tbs olive oil over medium heat until crispy. Remove to drain on paper towels. Reserve fat to fry just about anything. Whisk together shallot, Autumn Apple Vinegar, mustard, salt and pepper to taste. 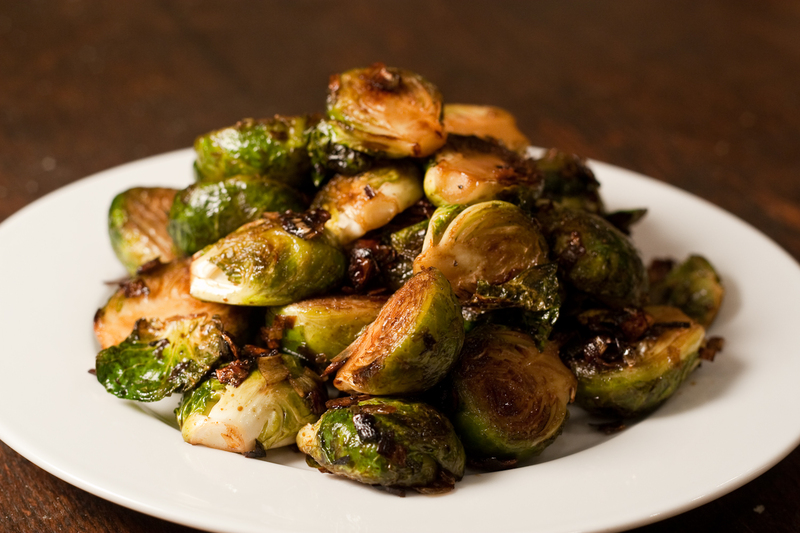 Thinly slice Brussels sprouts and place in a bowl with some extra room. Whisk Frantoio oil into vinegar mixture. Season to taste. 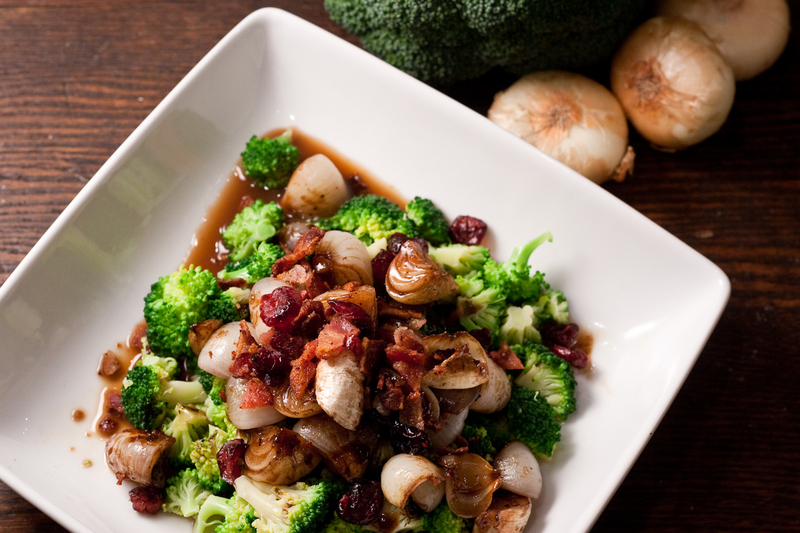 Dress brussels sprouts with 1/2 dressing and Pancetta. Let rest 5-10 minutes and season to taste with additional dressing if needed. November 2012 reveals great divide amongst the American people. Tomorrow’s election will leave 45+% of us deeply concerned about the next four years. Thanksgiving day will leave even more people deeply concerned about their fellow Americans’ palates. Forget politics and religion, it’s food that reveals the true regional and familial diversity in this country. 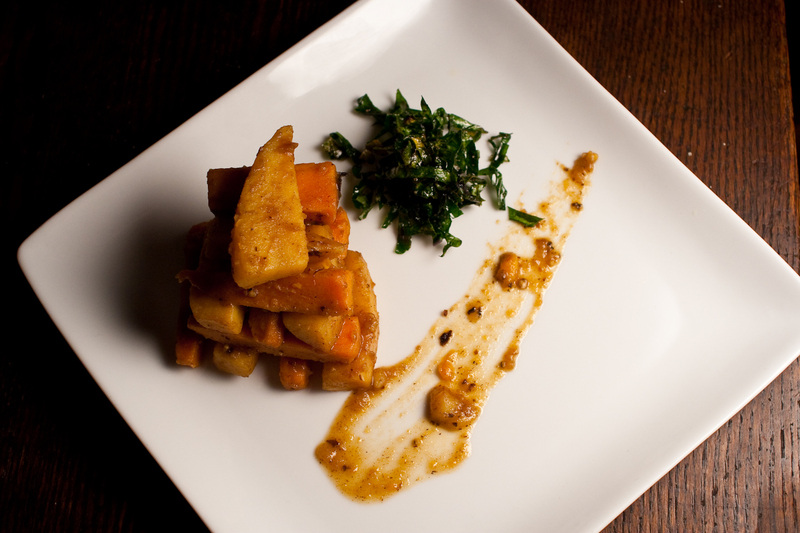 Moving to DC 10 years ago, the Southern traditions of greens and sweet potatoes were exotic and foreign. In New England, the only thing we boil for several hours is brisket, and we don’t add molasses or marshmallows unless we’re serving dessert. This past week, in the heated run-up to Election Day, I was determined to find common ground. Maple sugar brings sweetness and depth to the potatoes while a complex Autumn Apple vinegar delivers balance and brightness. Nutmeg and white pepper give complexity to these simple, bold ingredients. Richly sauced, the sweet potatoes needed grounding, and earthy kale, quickly fried or baked, adds both texture and grassy greenness to the dish. Best of all, it’s simple and brightly colored, a perfect addition to Thanksgiving tables filled with browns, beiges and whites. As for tomorrow’s election? We’re a diverse country, currently under great economic duress and social change. The division amongst voters and slow movement of our government reflects a system that is working, awaiting clear(er) direction from a strong(er) majority of voters. Like the growing diversity of my Thanksgiving table, I’ll celebrate the diversity of our country: not just of race or religion, but of the people, geography, industry and education that shapes our beliefs and perspectives. Whatever you believe, please vote tomorrow. Then we can begin arguing about whether stuffing belongs inside the bird (it clearly does). *While most cider vinegars are overpoweringly acidic with little depth, Sapore’s Autumn Apple provides balanced bite with fresh apple sweetness. To substitute, use a good sherry vinegar and add 2 cups of fresh apple cider to the braising liquid. Heat 2 tbs oil over medium high heat in a large skillet or sauté pan. Toss in potatoes and cook until beginning to brown, turning once or twice to caramelize on a couple of sides. Deglaze pan with 1/3 cup Autumn Apple Vinegar and sprinkle potatoes with sugar. Add water and cook covered for about 15 minutes until softened but still very firm in the center. Uncover potatoes and let liquid reduce as potatoes finish cooking. Add additional liquid if more cooking time is needed. When sweet potatoes are tender in the middle, but not mushy, toss with 2 tbs additional vinegar and let liquid reduce to a glaze. Season to taste with nutmeg and white pepper. *Kale can also be baked in the over. Toss with olive oil and salt and back ribbons at 400 until crispy. Watch carefully to prevent blackening.